Imagine walking into a booth, having your picture taken, and walking out not only with a photo but also with a computer-generated, algorithmic melody uniquely yours—based on the features of your face. That’s one of the projects Kedar Shashidhar ’15 of Corning, N.Y., has been working on. 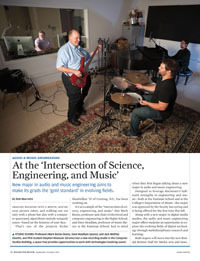 It’s an example of the “intersection of science, engineering, and music” that Mark Bocko, professor and chair of electrical and computer engineering in the Hajim School, and Dave Headlam, professor of music theory at the Eastman School, had in mind when they first began talking about a new major in audio and music engineering. Designed to leverage Rochester’s hallmark strengths in engineering and music—both at the Eastman School and in the College’s Department of Music—the major was approved by the faculty last spring and is being offered for the first time this fall. 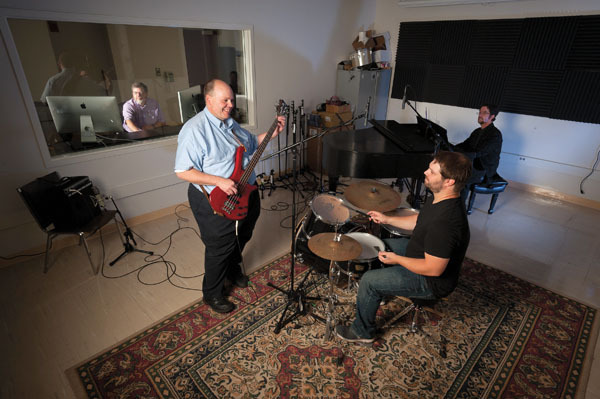 Along with a new major in digital media studies, the audio and music engineering major offers students an opportunity to explore the evolving fields of digital technology through multidisciplinary research and learning. Both majors will move into the new Ronald Rettner Hall for Media Arts and Innovation, now under construction between Wilson Commons and Morey Hall, in fall of 2013. Bocko, who is an affiliate faculty member at the Eastman School, says the demand for traditional audio recording engineers employed by professional recording studios has declined, largely because advances in audio technology have made it possible for people to invest a few thousand dollars and put together an excellent home recording studio of their own. Headlam says even when live music is recorded in a superior acoustical setting like Eastman’s Hatch Recital Hall, much of the processing can now be done on a laptop. At the same time there’s a burgeoning need for sonic media engineers in areas such as the video game industry, which is now larger than the music industry, according to Bocko and Headlam. Students trained in audio and music hardware and software design could very well end up finding efficient ways to use computers to generate more satisfying soundtracks, he says. But they’ll likely be working in teams with marketing and design people who’ll have to ensure that the music being produced appeals to people, Headlam adds. That’s why there will be two versions of the major. One version, leading to a bachelor of science degree, carries a heavier load of engineering and technology classes, and will be the preferred preparation for students who wish to pursue “hard-core” engineering careers in hardware and software design and development. The other version, leading to a bachelor of arts degree, will be less technically comprehensive, emphasizing creation of audio content and leaving room for students to complete a dual major in, for example, music or brain and cognitive sciences or in engineering disciplines. John Covach, professor and chair of the College music department and professor of theory at the Eastman School, says that the new major and facilities will help meet the increasing demand for music courses and performance. “The interest in music among Rochester students is really remarkable,” he says. Shashidhar once dreamed of playing saxophone for a living, then gravitated toward the more secure job prospects of chemical engineering—until he heard Bocko describe the new major at an orientation session. Now he’s looking forward to helping break new ground by obtaining a degree many people have never heard of. Bob Marcotte writes about the Hajim School for University Communications.